Sadly, the Hoosiers did not go forward to win the College World Series, but this in no way takes any of the shine off of their terrific season. Great job, guys! So, would you like to hear more about the 1922 baseball trip to Japan? The team arrived in Japan on Friday, April 14. They went through Customs, where the only problems they ran into was with the tobacco they were carrying. But these college men knew how to get around it — they passed off some of their cigarettes and cigars to the non-smokers of the group and stuffed their pockets with what they thought they could sneak in. The first game took place on April 22 in front of a large enthusiastic crowd but home team luck prevailed and Waseda won. The final record of the Waseda series: One victory, one tie, and five defeats. They lost all three games they played against Keio University but soundly defeated the semiprofessional Osaka All-Star team, 9-4. Tokyo even staged for us an earthquake, officially said to be the most severe in that city since 1894. We had already experienced several slight quakes since our arrival and when the first little shake came on this day we looked across the table at each other and smiled making mental note of one more experience to “tell the folks back home.” In a moment, however, this slight shaking increased to a violent jerking. This jerking gave way to a whipping motion as the earth rocked up and down, east and west, and north and south, accompanied by terrifying grinding, and groaning sounds as though the earth itself were writhing in agony. Want to know more about this amazing trip? We have recently scanned the entirety of the IU administrative correspondence, but recent donations from the family of team member Leonard Ruckelshaus and Edna Edmondson have provided us with a tremendous amount of detail about the trip. Ruck’s diary begins on the day of departure and was faithfully written in through May 27. The donation also included a beautiful scrapbook full of photographs and memorabilia, and many of the photos have been scanned and added to the Archives Photographs Database. And as always, feel free to contact us to schedule a visit to look through materials yourself! Leonard “Ruck” Ruckelshaus on IU’s Jordan Field, circa 1922. It has been such an exciting time for IU baseball, what a terrific season! This – along with a recent donation – has prompted me to share a story about another exciting time in IU baseball history. The accompanying agreement stated Waseda would pay $11,500 towards the IU team’s traveling expenses, as well as hotel and transportation costs associated with traveling to and from the hotel and ball field! In exchange, Abé proposed IU pay the Waseda baseball team $1,300 when they in turn visited in 1925, as well as the hotel costs for one night in Bloomington. Not a bad deal, right? Right. So university administrators made quick work of figuring out the logistics of such a trip, lining up transportation, securing passports, chaperones, etc. On March 28, the baseball team began their journey, departing Bloomington via the Monon at 11:30 AM. IU Baseball heads to the Far East! At the Bloomington train station, March 28, 1922. (Back Row, L to R) Joseph Sloate, Emmons Clay, Clarence E. Edmondson, Mrs. Clarence E. Edmondson, William Lowe Bryan, Mrs. George Levis, Coach George Levis, Leonard Conrad Ruckelshaus, Walter Wichterman, Ward Gilbert, and Robert Kidd. (Front Row, L to R) Rankin Denny, Assistant Coach Roscoe “Cow” Minton, Harry Gause, Leland Macer, Harold Lynch, and Dorsey Kight. Captain James Walker is not pictured. They traveled across country as minor celebrities to their destination, Seattle, where they would depart for Japan on the SS Keystone State on April 1 to the University of Washington baseball team’s crooning of farewell songs. So they were off. The baseball team, chaperones, and then these fellas, “Four I.U. ‘Bums'”. Recognize any of those names? How about #2, the “Chief Bell Boy” of the ship? The trip took over 2 weeks. Several of the landlubbing Hoosiers suffered terribly from seasickness. Player Leonard “Ruck” Ruckelshaus recorded in his diary, “[Emmons] Clay, Mr. and Mrs. Levis, Mrs. Edmondson, Joe Sloate, and Doresey Kight were very sick. Clay… said he would not cross the ocean again if they made him the Ambassador of England.” But they made it…minus one poor sailor who had a fatal accident and the boys stood by as witnesses to his sea burial. During World War II, Indiana University was not unlike other universities and colleges in that nearly every aspect of university operations underwent a number of changes. Personnel-wise, there were fewer men on campus, and many of them who were in Bloomington were in uniform. Baseball uniforms, that is! Well, at least for one spring month in 1943 and 1944. IDS, April 3, 1943. The “Business and Economics Building” is now known as Woodburn Hall. At the January 11, 1943 Athletics Committee meeting, IU Athletics Director Zora Clevenger reported that seven professional baseball “clubs” as well as the President of the American Association had contacted him inquiring about the use of the fieldhouse (now the Wildermuth Fieldhouse) for spring training. Teams included the Indianapolis Indians, Cleveland Indians, Cincinnati Reds, Pittsburgh Pirates, Brooklyn Dodgers, Montreal Royals, and the Toledo Mud Hens. The Committee recommended Clevenger and IU baseball coach Paul “Pooch” Harrell work with the administration to come to mutually agreeable terms with the Indianapolis Indians and another team. The Indiana Daily Student was all atwitter about this development. 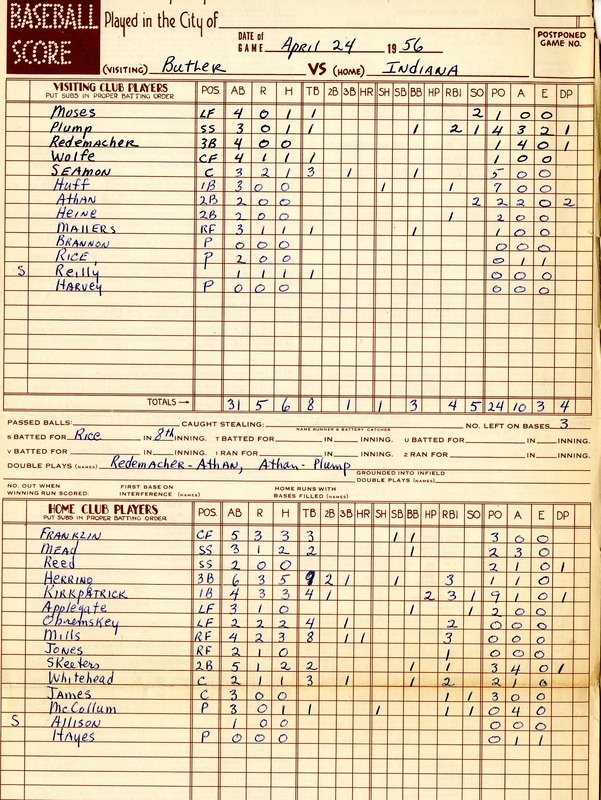 The Reds were the first to arrive on campus with team news coverage beginning in February followed by near daily reports regarding the teams’ arrivals, preparations, practices, and exhibition games. The reporters of the IDS were not alone – this was terrific excitement for Bloomington. The Jaycee’s gave a baseball banquet on March 18 for the Reds at Alumni Hall; tickets could be had for $2 per person. Speakers included Warren Giles, general manager for the Reds, Reds Manager Deacon Bill McKechnie, Ownie Bush, Indianapolis Indians owner, Clevenger, and President Wells. The IDS reported that a few of the more popular Reds players – which at that time included 1939 MVP Bucky Walters and 1940 MVP Frank McCormick — would be asked to “spin a baseball yarn, or two.” Mickey McCarty, managing editor of the Indianapolis News and former editor of the IDS, would serve as master of ceremonies. Due to the shortage of service staff on the war-time campus, the Association of Women Students President Leona Menze called together the sorority presidents to devise a plan to assist. Together they launched “a patriotic program designed to bring in members of every house as volunteer workers for the day.” Payment was given in the form of War Savings Stamps and the participants wore special armbands. 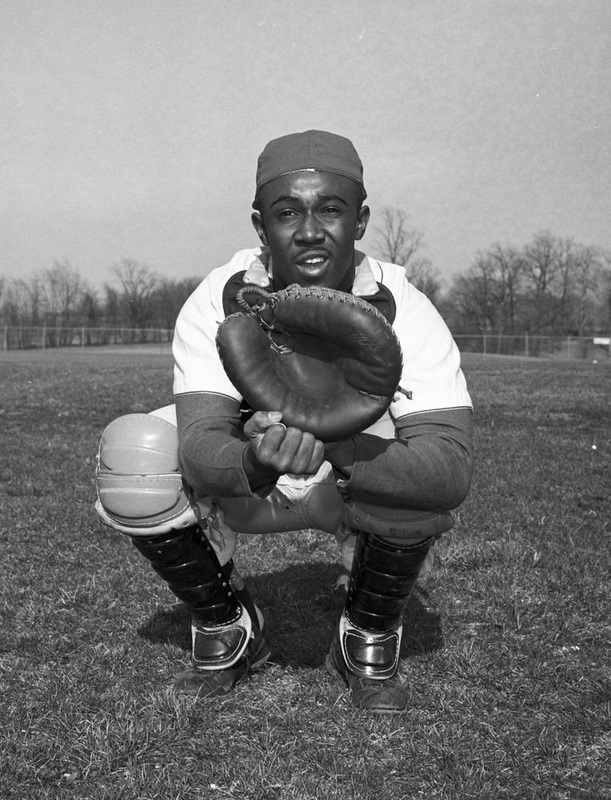 The Reds’ groundskeeper came to campus prior to the team in order to prep Jordan Field (now home to the IMU parking lot), though the team planned to begin training in the Fieldhouse until weather improved. Work included raising the pitching mound, enlarging the infield, and in general, just smoothing out the field. The team was housed at the Graham Hotel in town (now the Graham Plaza at 205 N. College), from which they walked to the 10th Street stadium (current home to the Arboretum) to use the locker facilities before heading over to the Fieldhouse for four hours of daily practice. 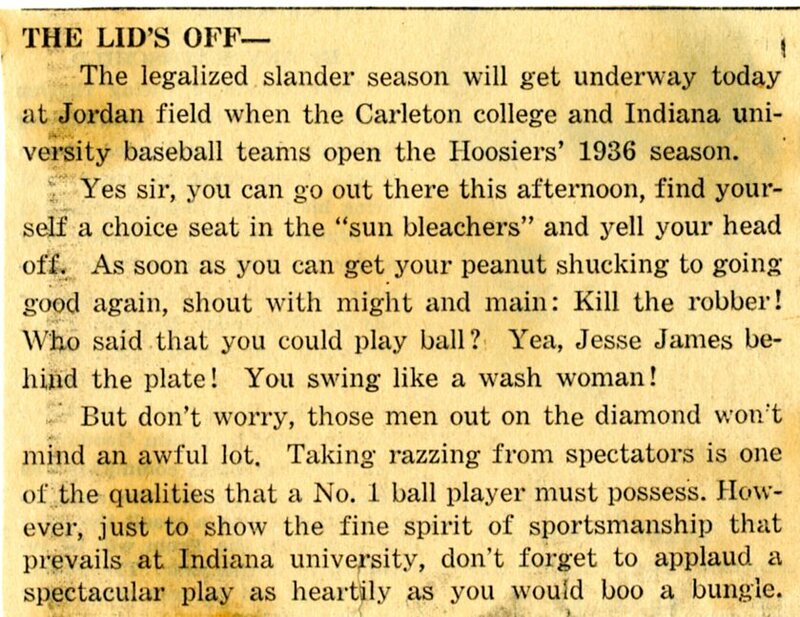 The IDS reported that during the Reds first practice “several hundred male students” gathered to watch. The first members of the Indianapolis Indians began arriving on March 27 with the entire team due to land in Bloomington by April 1 or shortly thereafter. Those familiar with Southern Indiana springs can guess that the weather was the biggest hurdle facing the two teams (well, with the exception of Reds player Bucky Walters, who tripped over a hurdle and bruised his heel whilst warming up one day). The Indians first outdoor drill was cut short when the winds became too much for the players. 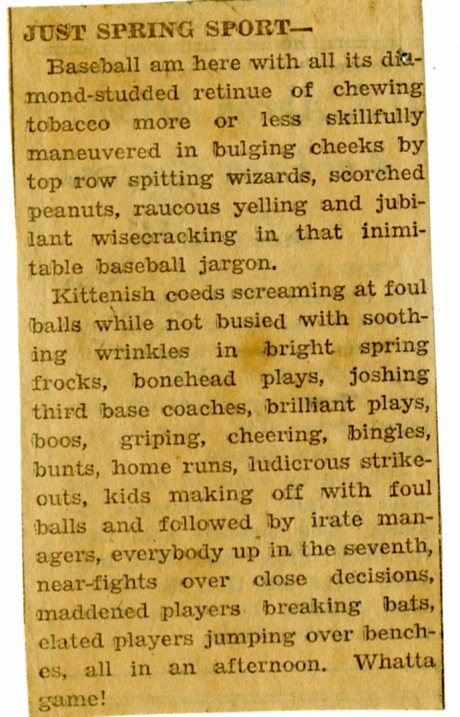 On April 8, however, the IDS reported on the first exhibition game held the previous day between the Reds and Indians on Jordan field. The Reds triumphed over the Indians, 8-6, in front of a capacity crowd of 2,000 students, townspeople, visitors, soldiers, and Marines. The Indiana weather became a factor for the next Reds exhibition game. The Chicago Cubs traveled from their spring training home of French Lick but alas, the game was cancelled due to rain. With that sad note, the Reds training camp came to a close and the Indians were left with ample Fieldhouse space for their next few weeks of conditioning. The Indians run laps in the Fieldhouse, March 28, 1943. 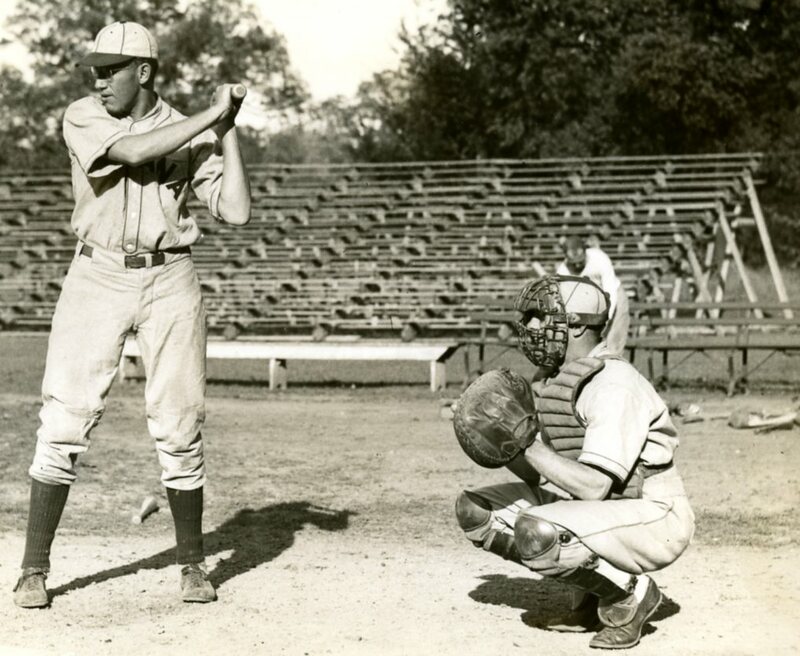 The professional teams were wholly satisfied with the campus facilities and both returned the following year, much to the enjoyment of Bloomington baseball fans. Want to read some more about this brush with baseball fame? The IDS is available on microfilm in the Government Information and Kent Cooper Services on the 2nd floor of the Wells Library. Also, as I researched for this story, I copied the bulk of the newspaper articles and they are available in the Archives – contact us for access!